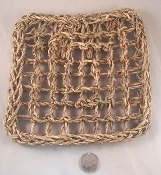 Braided Seagrass Mat - Mini - 7"x7"
Home > Toy Parts > Natural & Shredable > Braided Seagrass Mat - Mini - 7"x7"
This mini braided seagrass mat has tons of toy making potential! Fold and stuff for foraging. Hang for climbing. Stuff it and roll it. Make it a platform by hanging with bird safe chain or rope. Decorate with with toy parts for a fun toy wall. Great for the little birds in your flock. Approximately 7" x 7" x 1/2"